Published by Cyril Huze December 10th, 2016	in Builders, Customs, Editorial and Events. 1, 2 & 4 look very good. The Grifter is the nicest and cleanest looking bike here. The rear fender on the King Octane is total overkill. I agree, the Grifter is the best. Second, Evil Ethel. I love those fenders on #2. Grifter for sure. That is the one I voted for. Almost looks production ready. Just add some wire wheels for visual lightness. 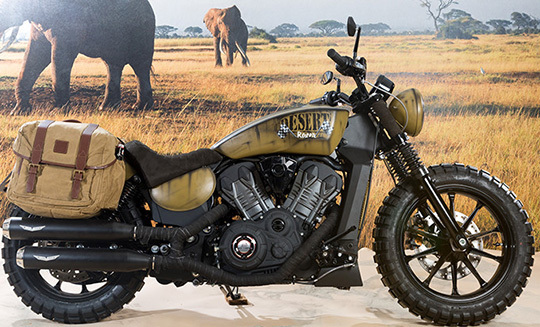 They look like what would happen if someone devoted a bunch of time to customize the Indian Scout. That said, they are all beautiful, and creative motorcycles. 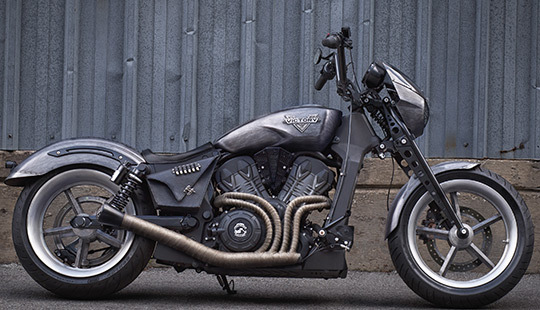 For one with half a braincell and the ability to do it – make a bolt-on cowl-type solo-seat for the Polaris Octane. I am not much moved by the Polaris Victory, but there are a few models that are not bad, bar some serious styling incongruities (it seems the latest iterations are beginning to address it – GOOD!). The GRIFTER drifts towards the Euro-dragster style and I like it. 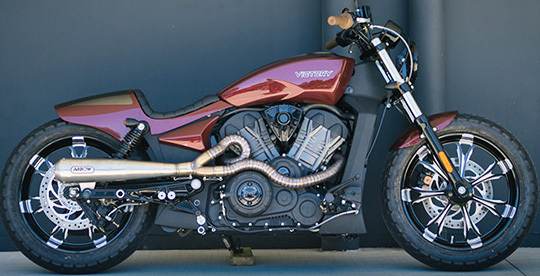 This is what Harley should have done with the V-Rod and this is what Polaris should do with the Scout/Octane – that btw carries a crib of the 1st gen V-Rod motor. The Grifter is the winner in my book. Not sure about those wheels, though. King Octane fenders are a non/starter for me. Great work and all 4 have raised the bar for this Model! if I was getting ready to Buy my First, second, third Bike and was 30 years young this would be on my List of Bikes to Own. How could ANYONE even think about purchasing a Sporty? Great Bike! Seen the Strokers bike in person .. …. worthy of the win! All are great but I agree that the Grifter best complements the Octane’s sporty frame and attitude. If Brisan was smart they would sell that fender/seat.